Pope Francis began his 2015 Asia tour with a visit to Sri Lanka. Pope Francis, the head of the Roman Catholic Church, arrived in Sri Lanka to begin his 2015 Asia tour on Tuesday. 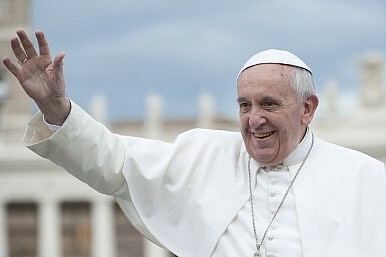 He is the third pope to visit the country. In Sri Lanka, Pope Francis called for national reconciliation. Sri Lanka concluded a 26-year-long bloody civil war in the late 2000s that resulted in the Sinhalese-majority government defeating Tamil separatists in the country’s Northern Province. Since then, the Sri Lankan government, notably former President Mahinda Rajapaksa who was voted out last week, has come under criticism for alleged war crimes during the civil war. Rajapaksa’s government was the subject of a United Nations Human Rights Council (HRC) resolution which called for an independent investigation into war crimes toward the conclusion of the civil war. The Tamil separatists were also accused of atrocities. Francis’ visit is the first papal visit to Sri Lanka since the end of the civil war. He was received at Colombo’s international airport by Sri Lanka’s newly elected president, Maithripala Sirisena, who managed to beat his predecessor Mahinda Rajapaksa in an unexpected election result last week. Pope Francis spoke at the Colombo airport before an enthusiastic crowd. He told Sri Lankans that peace would come only by “cultivating those virtues which foster reconciliation, solidarity and peace.” He added that for Sri Lanka, the “pursuit of truth” with regard to what happened in the civil war was important, “not for the sake of opening old wounds, but rather as a necessary means of promoting justice, healing and unity.” Francis did not make any overt references to accusations of wartime atrocities by either the government or Tamil separatists during the war. In Sri Lanka, Francis attended a multi-faith meeting with religious leaders and, on Wednesday, he will canonize 17th Century missionary Joseph Vaz as Sri Lanka’s first saint. He will also travel to the country’s war-torn Northern Province to attend a prayer ceremony at a church serving a Tamil-majority community. Catholics make up nearly 7 percent of Sri Lanka’s population of 21 million according to official government statistics. About 70 percent of Sri Lankans–mostly members of the majority Sinhalese ethnic group–are Buddhist. 13 percent are Hindus and 10 percent are Muslims. Non-Catholic Christians comprise just over one percent of the country’s population. Sri Lankan Catholics are notably split between ethnic Sinhalese and Tamils. Following his tour of Sri Lanka, Pope Francis will continue his Asian tour with a visit to the Philippines, which is home to one of the largest Christian populations in Asia. The Pope is expected to deliver an open-air address in Manila that will likely draw one of the largest crowds ever for a papal visit. Pope Francis’ most recent trip to Asia in August 2014 included a tour of South Korea.